A native of New York, Jack Kurutz is an avid recitalist, chamber musician, and advocate of contemporary classical music. He is a founding member of the Living Room Chamber Music Project, which aims to make live music accessible and enjoyable by bringing performances from the concert stage into the home. Upcoming concerts include a solo recital of all Russian piano music, two-piano recitals with pianist Becky Billock, and chamber music with the University of Pittsburgh’s ensemble-in-residence, IonSound Project. Please visit the Calendar of Events Page for more information. Mr. Kurutz received his undergraduate degree from the University of Miami, studying with Ivan Davis, and earned his Master of Music from New England Conservatory in Gabriel Chodos’ studio. In 2005, Kurutz completed an Artist Diploma from Carnegie Mellon University, and currently coaches with Ralph Zitterbart. 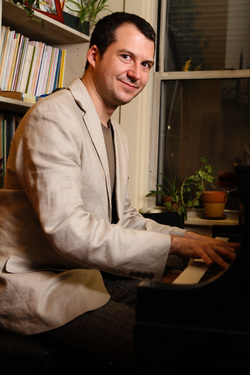 In September 2007, Mr. Kurutz won First Prize, Artist Division, in the Liszt-Garrison International Piano Competition sponsored by the Baltimore-Washington Chapter of the American Liszt Society. Additionally, he was awarded a prize for the best interpretation of a Franz Liszt composition. He was a finalist in the 2009 Simone Belsky Competition and the 2010 Steinway Society of Massachusetts Competition. In addition to teaching a private studio, he currently serves on the faculty at the Pittsburgh Music Academy and holds a teaching position at the Carnegie Mellon University Preparatory School.